← Selling a Home: It Is As Easy As Holding a Raffle! 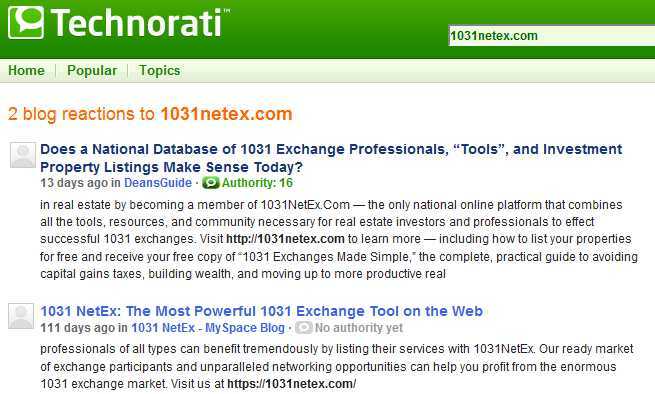 Last week I asked the question, “Does a National Database of 1031 Exchange Professionals, “Tools”, and Investment Property Listings Make Sense Today?” In that article I took on the idea that was being solicited to me by 1031netex.com’s Michael D. Fox. I pointed out the obvious: the 1031 industry has a black eye from the multiple embezzlement cases that have greatly shaken consumer confidence. I outlined the FEA’s role in policing the industry and pushing forth new legislation on a national political platform. And finally I noted the fact that a national database might be helpful to Realtors and 1031 professionals-yet how would it benefit the consumer? I finished by pointing out the lack of significant traffic 1031netex was receiving; to be fair I illustrated my own traffic patterns by using both Technorati and Alexa the best blog site traffic measurement tools available. Michael D. Fox | drfox@1031netex.com | 1031netex.com | IP: 72.219.148.44Thank you for your interest in 1031NetEx.Com. We are, as you said, an “online nation [1031 exchange] database,” and also much more. As well as being a national database for 1031 exchanges,1031NetEx.Com provides a powerful array of other tools and resources for investors and real estate professionals engaged in successful 1031 exchanges.Anyone logging on to our Web site at http://1031netex.com can join free of charge and list their 1031 exchange-ready property and/or their professional services, as well as search for 1031 exchange property and services. Free basic members have access to the 1031NetEx library and resource materials, and can search properties and professionl services. Premium members (who pay only $29.95 per month) can also post their own professional marketing materials and receive additional benefits.In addition, 1031NetEx.Com provides its Premium members with email alerts for all important exchange deadlines; individualized timeline management in an easy to read graphic format for each exchange; online access 24/7 to all 1031 exchange documents; secure and easy storage and sharing of exchange documents; secure and easy communication between all interested parties; a centralized, easy to use, and constantly available management hub for all aspects of 1031 exchange transactions; and independent, objective, reliable, and easy to understand 1031 exchange information. The combined thrust of 1031NetEx.Com’s tools and resources is to empower our members to proceed with knowledge and confidence in undertaking 1031 exchanges.You mentioned the lack of consumer confidence in the 1031 exchange market caused by some presummed embezzlement of investor funds by qualified intermediaries. 1031NetEx.Com addresses the question of consumer confidence by making the consumers themselves more prepared and confident in managing their 1031 exchanges and selecting their professional team. By eliminating the fear factor and closing the knowldege gap in regard to 1031 exchanges, 1031NetEx.Com directly empowers investors and real estate professionals to make intelligent, strategic investment decisions regarding their 1031 exchanges. 1031Netex.Com will “gain the traction” we need on the Web to become the “go to source” for consumers and 1031 exchange professionals. We began our online operations in late June 2007. Since then, we have more than doubled our Web traffic each month and continue to grow. We are constantly working on improving our SEO, as well as our marketing, online and off, and we expect even greater growth momentum in the future.Your closing observation about 1031NetEx.Com was that “there is a need for a database 1031 site if it is done properly.” Agreed! That’s exectly what 1031NetEx.Com is doing – and more.Sep 26, 5:49 AM — [ Edit | Delete | Unapprove | Approve | Spam ] — Does a National Database of 1031 Exchange Professionals, “Tools”, and Investment Property Listings Make Sense Today? I can not go on without addressing this statement. It is more than presumed that funds were stolen. The problem is that everyone, except for the victims who lost their money to the defendants, is calling it something else. Let’s be honest here and make no mistake in calling the situations what they have become. The funds are GONE and they did not just get up and walk away. They were spent, misappropriated, diverted, or whatever term softens the blow. The fact of the matter is that these funds were SPENT without investor permission or the investor being aware that the funds were being removed from the accounts in which they began. 2. Mr. Fox outlines the “tools” members can use: email alerts for important deadlines; time line management; 24/7 online access to all 1031 documents; storage of said documents; secure and easy communication between all parties; centralized management hub for all aspects of the 1031 transaction; and 1031 exchange information aka a library of information. The tools that Mr Fox outlines will be helpful but they are a far cry from building consumer confidence. They do NOT address the major concern in any 1031 exchange for investors: control over the investor account. Every professional I have spoken to, every investor who has been embezzled, every attorney who performs exchanges, every person who has an insurance industry stake, and every single tax account who has weighed in on investor protection all agree on one simple solution: who holds the keys to the investor’s cash bank accounts? The solution as it has been related to me by these professionals is the absolutely unwavering contract by both the investor and the exchanger that the investor’s funds will reside in an account that can only be accessible when BOTH parties sign off on the funds movement AND this fund will NEVER hold co-mingled funds aka funds owned by the investor and by the exchanger in the same bank account. It is that simple yet so many consumers do not seem to understand this fact. Suffice it to say, 1031netex’s tools are more suited, in my opinion, to Realtor’s selling the properties, exchangers exchanging the properties, or any other service professional- not the consumer. 3. The final piece to the puzzle is the idea that 1031netex will gain enough consumer and professional traffic (eyeballs) in order to make it a viable source and player in the SEO wars for google search engine searches within their niche. Mr. Fox does not provide proof to his claim that netex.com has “more than doubled our Web traffic each month (since June 2007). In order to become the “go to source” for consumers consumers first must know you exist! In my initial analysis I used screen shots of Technorati and Alexa to show where 1031netex’s traffic ranked so far. According to this graphic, 1031netex has LOST traffic rank. They have fallen from a rank of 2,267,353 down to 2,271,827. 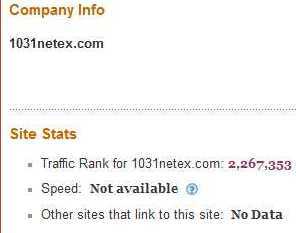 That means 4,474 sites have surpassed 1031netex’s traffic rank position since our initial investigation. Hardly a good sign but one that is typical for a brand new site with very very little traffic. If Mr. Fox is out there and reading, if you have actual unique visitor numbers you can state with documentation we are more than willing to document any corrections or new upward fluctuations in traffic. Consequently the time is right for a information database on 1031 exchanges outside of the Federation of Exchange Accommodators. Yet with the case of 1031netex, I would be more inclined to look for something that will provide more help to the consumer than netex’s “tools” claim. This seems like a good site for Qualified Intermediaries and any professionals performing exchanges. For consumers and investors stick to hands on legal controls over your exchange funds whereabouts and movements throughout the process: two signatures should be your mantra!